In our house, usually it's Alex that makes the biscuits, using a recipe passed on to him by his mother. And those biscuits are good. I however, don't enjoy making them. Partly because they never come out as good as when either of them make biscuits, and mostly because I find the recipe too vague (as in, non-existent) and I loathe fussing with shortening. Sometimes you really need biscuits to round out a good meal, though, which led me to paging through my favorite bread-making book, The Tassajara Bread Book. Why it took me so long to get around to using this recipe, I don't know. 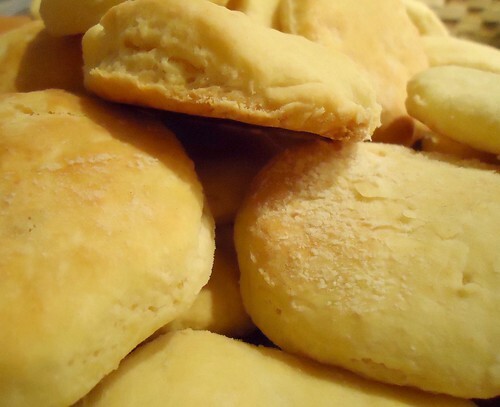 They are hands down, the best biscuits I've ever been able to make. The recipe goes together quickly, uses few, whole ingredients, and the biscuits come out consistently from batch to batch. The big test for me is whether they taste good the next day, or do they get hard and dry? These stay flaky, buttery and delicious and are perfect for next day egg sandwiches, so make plenty (as always, I double this recipe.) 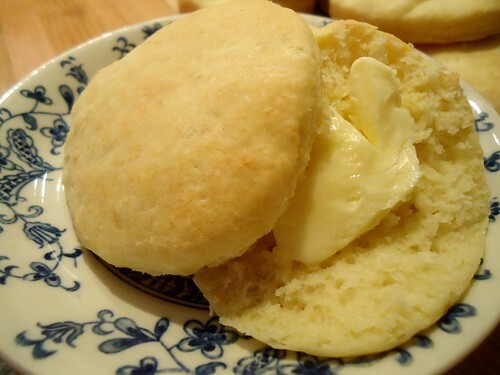 Do be cautious when mixing the batter-don't over mix or you'll end up with not very fluffy biscuits. These also work equally well as drop biscuits. *I just use all unbleached white flour and I also use my stand mixer to blend ingredients. Combine flours, baking powder and salt. Cut butter into dry ingredients with a pastry cutter or two knives or rub gently between hands until pea-sized pieces are formed. Make a well in the center and add the eggs and milk. Beat the eggs and milk with a fork until smoothish. Then continue stirring with the fork, gradually incorporating flour, until all is moistened. On a floured board, knead the dough just enough to bring it together. Roll the dough into a rectangle 1/2 inch thick. Fold into thirds. Tun the dough a quarter turn, and repeat rolling and folding. Repeat once more. Roll out dough to 1/2 inch thickness. Cut into rounds with a floured cutter or glass. Place on ungreased sheet and bake at 450F for 8-10 minutes until bottoms are browned lightly and the tops slightly golden. Do not overbake. Next up--these biscuits with strawberries and fresh cream. I mean, looking out my window, I can hope that one day in the near future, we'll have strawberry season, can't I? I was all excited to have FLOWERS on my strawberries and last night saw photos from May 29 last year where I had fruit that was turning RED!!!!!! Hopefully June still, though!?!? !